R|278} Profile of violet leaf (enlarged). M.
Process B. With pencil on tinted paper, reinforced with white.Example for practice. Study of profile of violet leaf R.278. This is the most convenient and rapid mode of chiaroscuro study; all shades below the tint of the paper being carefully worked with the black; and all lights higher than the tint of the paper being as carefully worked with the white: but the method is greatly liable to the abuse of laying the pigment at random on the light. Dürer, Mantegna, and other such perfect draughtsmen, lay the light on such studies with a pen or brush line, gradating it as the lines of engraving. This is not an advisable method for the general student, being much too laborious, and requiring consummate skill. But he is to remember that the difference between daubing and painting is in the perfect gradation and intention of his imposed light. This study of violet leaf is rudely and imperfectly done, but well enough for example: I wish every student to draw the profiles of every common leaf from nature in this manner. Process B. With pencil on tinted paper, reinforced with white. Example for practice. 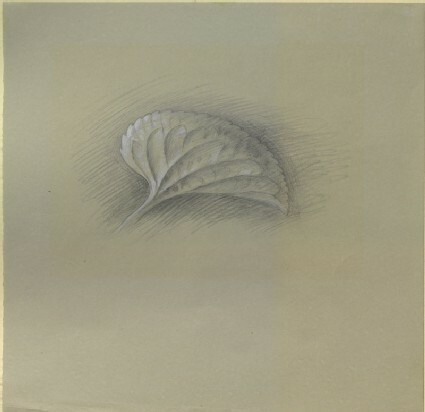 Study of profile of violet leaf R.278.